WASHINGTON — Three McDonald’s restaurants along the route of the Capital Pride Parade, an event expressing pride in the sin of homosexuality, will use rainbow french fry boxes to correlate with the event. The locations to utilize the boxes will be the McDonald’s on 14th Street NW, 17th Street NW and M Street NW. According to reports, McDonald’s has long been a proponent of homosexual causes, as it added “sexual orientation” to its nondiscrimination policy in 1999, made domestic partners of homosexual employees eligible for benefits in 2004 and founded the PRIDE network in 2005. Other sponsors of the event include Marriott International, Capital One, UPS, Geico, Red Bull, AT&T, Wells Fargo, State Farm, Starbucks, IKEA, Coldwell Banker, Coca-Cola, American Airlines, GAP, Heineken, Kaiser Permanente, and Citibank. 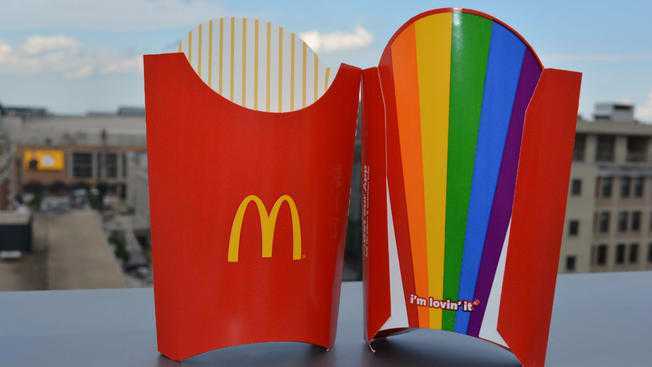 Public reaction to the rainbow fry box announcement has been mixed, with some applauding McDonald’s for being inclusive and others opining that the company should stick to selling burgers and fries. “I see rainbow fries in my future,” another wrote. “The rainbow is God’s promise to never again destroy our beautiful Earth with water. It is not and should not be used by the lgbqrstuv as a symbol of their perversions!” another declared.